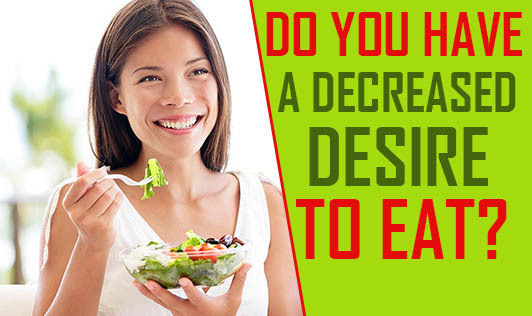 Do You Have A Decreased Desire To Eat? A decrease in desire to eat, medically termed 'anorexia', is also commonly called 'loss of appetite'. In most cases this happens in spite of the body's energy requirements not changing. Usually it's an underlying illness that causes a loss in appetite. When the illness is treated, the appetite returns to normal. Loss of appetite makes a person eat less and this can cause unintended weight loss and decrease in nutrient supply. In the long run, it can lead to malnutrition and related problems. Causes for decrease in appetite be either mental, emotional or physiological. Diseased liver or kidney, cancer, hypothyroidism, medications or emotional problems like depression, loneliness, nervousness, worry, etc can lead to decreased appetite or a complete lack of desire to eat. Change the environment in which you eat. Make the foods interesting and flavorful. Experiment with new dishes every now and then, to kill boredom. Eat with a companion or in a group. If there's a medical problem, consult your physician for treatment, and your dietitian for a suitable diet.